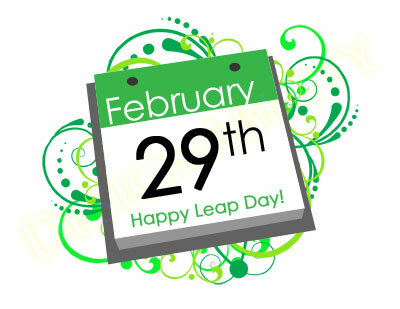 The 29th February, also known as leap day or year in the Gregorian calender, only occurs every four years. This means that we gain an extra day in the year. In the Chinese calender, leap years will only occur in the years of the Monkey, Dragon and Rat. A leap day is observed because a complete revolution around the Sun takes slightly longer than 365 days. It compensates for this lag, realigning the calendar with the Earth’s position in the solar system; otherwise, seasons would occur in a different time than intended in the calendar year. The Gregorian calendar repeats itself every 400 years, including 97 leap days, which is exactly 20,871 weeks. Over this period, February 29 falls on Sunday, Tuesday, and Thursday 13 times each; 14 times each on Friday and Saturday; and 15 times each on Monday and Wednesday. The order of the leap days is: Thursday, Tuesday, Sunday, Friday, Wednesday, Monday, and Saturday. A person who is born on February 29 may be called a “leapling” or a “leap-year baby”. In non-leap years, some leaplings celebrate their birthday on either February 28 or March 1, while others only observe birthdays on the authentic intercalary date, February 29. Here at Masteflex, we are all hard at work to make sure we get your orders out on time. If you have an questions about our products, visit our website or give the office a ring, we are happy to answer any questions you may have. This entry was posted in Antistatic & Electroconductive hose, Charity and Other, Constructive, Dust & Fume Extraction, High Temperature Hose, HVAC - Heating, Ventilation and Air Conditioning, Materials Handling - Plastics, Rubber , Powders, Street cleaning leaf and grass collection, Uncategorized, Woodworking Industry and tagged abrasion resistant hose, air and ventilation hose, DUCTING, Ducting Connecting Systems, ductings, Dust extraction hose, flexi ducting, Flexible ducting, flexible ductings, Flexible hose, flexible hoses, Fume Extraction hose, High temperature hose, hose, hoses, Masterflex technical hose ltd, Polyether-Polyurethane, Polyurethane ducting, Polyurethane hose, PTFE Ducting, PTFE Ductings, PTFE Hose, PTFE Hoses, PU hose, PUR hose, pur hoses, PVC ducting, PVC ductings, PVC hose, PVC hoses, Silicone Ducting, silicone hoses, suction and transport hose, templine Heated Hoses, Weld Fume Extraction Hose. Bookmark the permalink.